Is Constantine putting Fedora back at the top of the Linux world? 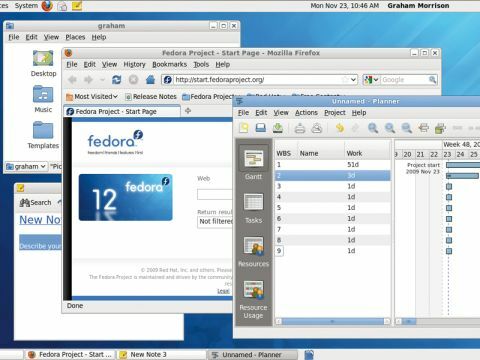 Fedora 12 (or Constantine) is the last in the trinity of great Linux distributions that have been released in recent months. First came the new Ubuntu 9.10 at the end of October, followed by OpenSUSE 11.2 in early November and finally Fedora 12 in mid November. These three are at the top of the influential DistroWatch hit list, and they're the distros that most define how Linux is being used and where it's likely to go over the next 12 months. Despite bundling essentially the same software, it's the unique configuration of each distribution that gives them their character. Just look at the colours chosen by each for their default themes. Ubuntu goes for earthy brown, OpenSUSE for spring green and Fedora for oceanic blue. There's very little spectral overlap, and that pretty much sums up the differing philosophies behind each. Fedora's unique selling point has always been freedom. It's one of the few distributions that takes a hard line against bundling proprietary codecs, encumbered patents and software that isn't defended by a recognised Free Software licence. This has its disadvantages for ordinary users. You won't be able to use certain hardware that needs a firmware file, nor 3D-accelerated proprietary drivers from the likes of Nvidia. You can't play Flash movies because Adobe's plug-in is closed, and MP3 playback is a patent minefield. Novell's recreation of Microsoft's .NET framework is also freshly dropped from the default 12 installation, replacing the Mono-based note-taking tool with inferior editor GNote. But Mono is still installable on the disc, for now. This being Linux, you can always work around these limitations. But while every other distro is making it easier to do so, Fedora makes no concessions. Its developers would argue that that's the whole point. Installation is now easy, with the only slight sticking point being the ancient Location Selection tool that makes it virtually impossible to choose a main city (and therefore your time zone). Ubuntu solved this problem, so there's no reason for Fedora to leave it unfixed. After the installation is finished, you have to create your account details before you're dropped into the standard Gnome desktop. This is exactly the same version provided by Ubuntu and OpenSUSE 11.2, and it means the Fedora desktop inherits a number of significant new features for free. There's the Empathy instant messenger, for example, and the built-in Epiphany web browser now uses the much quicker WebKit engine used by Chrome and Safari. You can now annotate PDFs, manage time with the Time Tracker applet and easily connect with BlueTooth devices. It's a similar story if you opt to use the KDE desktop, where you get the default selection of KDE apps, styles, themes and icons. Version 12 makes it possible to install Moblin on top of your Fedora installation. Moblin is a netbook OS initially designed by Intel. However, the Fedora version has a massive advantage over the Intel version because you can still access, install and use any other Fedora packages. Fedora 12 is also one of the first distributions to support the Kernel Mode setting out of the box, which is enabled on various Radeon and GeForce graphics cards. It's a way to get higher quality graphics onto your display from the moment the distro boots. If your card supports it, you'll get faster boot times too. Overall, we think that Fedora is still the best distribution for businesses and developers. There's fantastic support for the Eclipse development environment, for example, along with others like Nokia's Creator. It remains one of the few distributions where you can choose to install a simple build environment at installation time, and if you need to run Fedora as a virtual machine, you'll find dozens of enhancements that improve performance and filesystem accessibility. There's also no avoiding the fact that Fedora is tightly coupled to Red Hat Linux, one of the most respected enterprise grade distros currently available. Constantine is a strong upgrade, keeping up with the Joneses while firmly sticking with its Free Software philosophy.